Nonya kueh and cake recipes was created to share with friends and relative who are interested in baking kueh or cake. 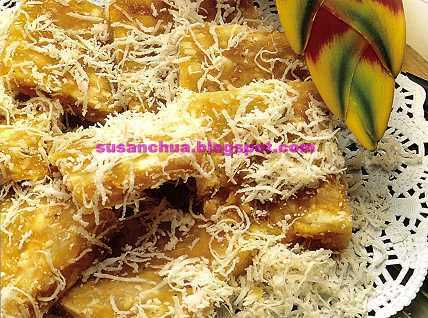 Nonya Kueh or Straits Chinese Kueh(cakes) are made from a variety of fulsome and flavourful ingredients such as coconut milk, sweet potatoes, tapioca, palm sugar and pandan leaves. 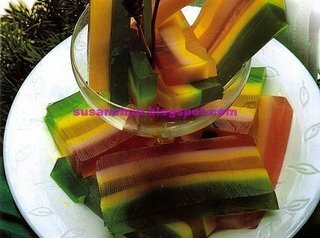 Presented together, they make up a colourful, pleasing platter, and thus are among the most popular items to be enjoyed during tea time, as a sweet dessert, and as part of the menu at festive occasions. Traditionally Peranakan girls or Straits Chinese were trained to perfect the art of making nonya kueh — skill in the culinary arts could, along with other skills, lead to a better marriage. Many Nonya or Peranakan still spend time making kueh for their families, as they believe the more effort you put into preparing food for your family, the happier all will be. Below are some of the Nonya Kueh and Cake Recipes that I have collected and hope to share with everyone who are interested in. 1. To prepare bottom layer: Boil green pea flour, castor sugar and water until the mixture thickens. 2. Add water chestnut cubes and half fill pandanus cups. 3. To prepare top layer: Boil rice flour, sugar, salt, coconut milk and water until the mixture thickens. 4. Fill pandanus cups and decorate with chopped cherries. 1. Peel tapioca and cut into bite-sized pieces. Boil tapioca in salted water till softened. Drain water. 2. Mash tapioca while still hot. 3. Mix in the melted palm sugar and combine mixture well. 4. Dish out tapioca mixture onto a flat tray. Leave mixture to stand for 2 hours. 5. 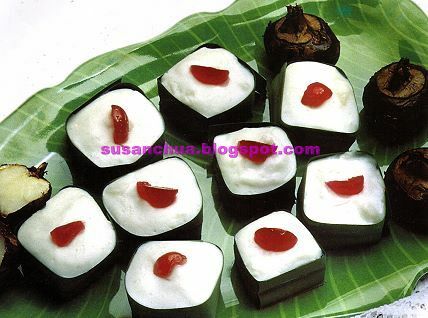 Cut tapioca into small squares; roll in the grated coconut. Serve. 1. Combine the mashed potatoes with cornflour and water. 2. Roll the mixture into small balls. Press flat and put a little filling in the centre. Seal dough and roll again into balls. 3. 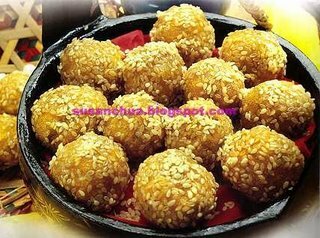 Roll sweet potato balls in sesame seeds and dust with cornflour. 4. Deep-fry potato balls till golden brown. 5. Remove from heat. Drain well on a paper towel. 6. Serve while potato balls are still warm. a. Boil agar powder, water, sugar and pandan essence. b. Keep it hot on very low heat. a. Boil agar powder, water, sugar, coconut milk and pandan essence. 3. Wet a mould. Take 50 ml. of hot agar A and add a drop of red colouring. Stir and slowly pour into the mould. 4. When half-set, take 50 ml. of hot agar B and colour it red. Pour on top of the hardened agar. 5. Repeat process 3 and 4 with other colours and leave to set.